A few months back I tested and reviewed the brilliant Trekz Titanium Bone conduction Headphones from Aftershokz and make no apologies in regards to how much I enjoyed them as a runner. The comfort, sound quality and overall safety they provided due to maintaining situational awareness is so important when out road running or even on trails. There was also the accessibility benefits due to the bone conduction technology which enables some people with hearing impairments to have sound waves channelled directly to the inner ear.. Read my previous review for all that goodness.. Following my interview with Aftershokz CMO – Kim Fassetta, I had the chance to trial Aftershokz‘s latest offering to the bone conduction headphone market, the Trekz Air! 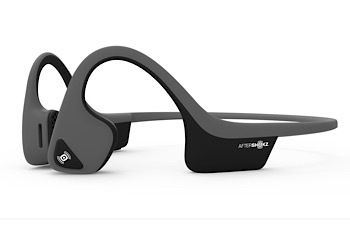 Aftershokz say they have taken the already impressive bone conduction technology to the next generation so I was really keen put them through their paces.. Weighing in at just 1.06oz the Trekz Air are 20% lighter than the Titanium’s and whilst that difference is only 0.21oz, I did find them comfier to wear and after a very short time I totally forgot I had them on. The unit is visibly smaller with the small control/battery parts of the earphones (behind the ears) being approximately half the size of its larger sibling without compromising against the 6 hour battery life or wireless range. In the sound stakes, I tested the Airs in an office environment on calls, in a quiet room and also on several runs both roadside and in the sticks. I have to admit that whilst I found the Airs fractionally quieter than the Titanium’s there was very little in it and thanks to the Titanium band the earphones sit nicely in place without any movement bounce whilst maintaining total flexibility..
My only negative and it’s the same for all rear band headphones is that this may not work for gym users when when laying down it can get in the way, this isn’t however unique to Aftershokz and for me is well worthy of the compromise for all the other benefits.